The Lifetime 1479 48 Inch Portable Hoop System is one of the company’s offerings for the budget conscious hoop junkie. Featuring a 48 inch Shatter Guard fusion backboard which is claimed as shatter proof compared to acrylic, a quick-adjust pole system, and a Slam-It double compression rim, this is promises to be close to the real thing as you can get without breaking the bank. Is it true? Let’s go on to the review. Installation is easy for this portable hoop. The instructions that come with it are easy to follow and assembly can be done in a few hours. As usual with these big portable hoop systems, it is recommended to have 2 or more people to help with the assembly due to the weight of the parts. Height adjustment is not as easy compared to other hoops as you need a broom stick or some other long object to adjust it. Compared to other portable hoops which do not need another object to have the height adjusted, this is somewhat of a downer for this hoop. Minor yes, but still a negative. Moveability is not that difficult since this portable is not that big and heavy. 2 adults can move this thing with relative ease. Otherwise, remove water/sand from the base before moving it. While the look is not something to write home about, it’s alright for its price. The build quality is superb and the poles are powder coated for rust protection. 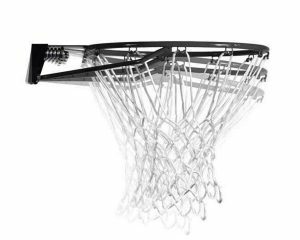 The Slam-It rim can take some abuse from dunkers, but with this being a portable hoop, slamming it home should be done with caution. 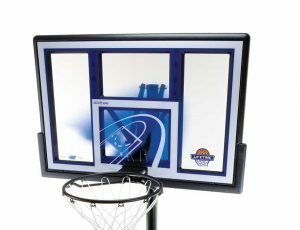 The backboard is very sturdy and wobbling/shaking is kept to a minimum. It’s made from Makrolon Polycarbonate which Lifetime claims is virtually unbreakable. 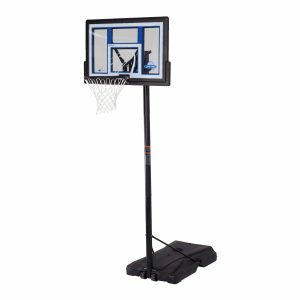 The Lifetime 1479 is actually a great deal for someone looking for a portable basketball system who is also on a tight budget. It’s on the lower class when it comes to portable hoops but you will have a hard time finding another system that is better than this for its price. From it’s build quality and the ease of installation, this is definitely a steal. 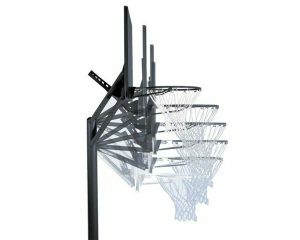 While the height adjustment mechanism can use some improvements, this is still a great hoop. Another plus factor is Lifetime’s excellent customer service, which is certainly lacking in other hoop manufacturers.